Are Brights the New Hue Faves of High Fashion? Blac Chyna may not be the first person that comes to mind when introducing the latest offerings in fashion, but on Instagram, she was showing off two hot new pieces to her wardrobe that seem to speak of high fashion’s preference for bright colors! The first pic she posted was the highly coveted Coda Neon Sneaker by Gucci. Super bright and super in-trend, it’s candy colors gone neon! Model and sneaker-head Jourdan Dunn also got her hands on some Codas donning the yellow pair on her page. Available in pink, orange, green, and yellow, they retail at $640, so we’re give the Codas three ouches for their price. 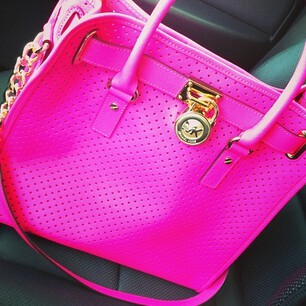 The second pic Blac Chyna snapped was of the popular Hamilton bag by Michael Kors (you’ve likely seen the black and gold studded version) in an awesome bright pink, giving the classic shape and style a youthful look. The Hamilton bag, on average, retails starting at $400, depending on the material, color, and details. Because it seems more reasonable spend four Franklins on an item that can take you indefinitely from day to night, we’ll give the Hamilton two ouches on its price tag.